Subway to another galaxy? To the future? To the past? Dr. Michio Kaku says it may be possible. When I was seven, living in rural Hertfordshire, England, I would take walks in the countryside near our cottage. I had a persistent fantasy that, around some bend in the path or past some hedgerow, I would discover a magic shortcut that would take me immediately to someplace far away where I'd rather be, perhaps the bustling streets and shops of London, or the docks at Southampton where I could see the great ocean liners coming and going. (No, I hadn't read the Narnia books.) According to the clip above, it may be possible to create such shortcuts, called wormholes. While it leaves some questions, like how we get the "negative matter" needed to keep a wormhole open, unanswered, it does make for pleasant speculation. Particularly fascinating, I think, is the effect of gravity on time, which means that wormhole travel would, of necessity, be time travel. Indeed, as Alex Fillipenko of the University of California at Berkeley says, any travel away from earth's surface is time travel, if only in a micro sense. It's interesting to know that, if a correction wasn't made for the difference in the rate of time passage between the satellite that transmits positioning information and your GPS device on the surface, using that device to guide a trip from L.A. to New York would result in your ending up somewhere in Massachusetts. 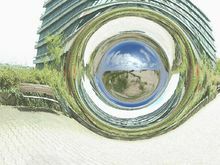 [i]mage of a traversable wormhole which connects the place in front of the physical institutes of Tübingen university with the sand dunes near Boulogne sur Mer in the north of France. The image is calculated with 4D raytracing in a Morris-Thorne wormhole metric, but the gravitational effects on the wavelength of light have not been simulated. Am I a language pedant; in Stephen Fry's word, a "loser"? Some friends -- she was a high school classmate, he's a retired teacher and published poet -- sent me the above clip. I don't think they sent it in reaction to anything I wrote here or to them, or said, but just because they thought I'd enjoy it. It is a clever piece, and the moving, nay dancing. typography is a joy. I agree with about ninety percent of what Fry says. Where he made me wince was his reference to those who decry the misuse of apostrophes, whom he specifically singled out as "losers." For a moment, I had the horrid feeling he might have seen this post. I'd like to think that I'm not some fusty language pedant. I'll confess to having weighed in on the "fewer/less" imbroglio, which I now regret. It's not only a losing battle, but one not worth fighting. I try to keep my own writing free of split infinitives and sentence-ending prepositions (unless, in the latter instance, it results in a clumsy construction; see Winston Churchill's rejoinder to someone who tried to correct his grammar). Nevertheless, I don't fault others for these things, and am glad to allow Enterprise and her crew "to boldly go". I have no problem with the verbing of nouns, including the verb "to verb". My wife, an archivist, takes umbrage at "archive" as a verb. Again, I think it's a losing battle, especially in the age of computers, when one can "archive" with a click or a keystroke. There are some things up with which (nodding to Sir Winston) I will not put. One is the misuse of apostrophes. I disagree with Fry if he thinks this is an example of something fresh or invigorating, like a clever neologism or the use of a word in a new context. It's just wrong, and it does harm to clarity. Perhaps it's "elitist" to call someone for not knowing the rules, but so be it. Fry seems to contradict himself. At first he says those who object to the creative use of language do so on the grounds that such usage is elitist, in which instance he allies himself with the elitists. Then, without using the e-word, he implies that those who object to incorrect apostrophe usage are guilty of snobbery. I plead guilty. ...if you do a web search for "Weiner" (yes, that Weiner) and "class act," the first thing you'll find is a link to this blog. Sol LeWitt (1928-2007) was an influential, though self-effacing, American artist of the past half-century. His work is considered to fall within two artistic traditions that arose in the late twentieth century: conceptualism, which sought to relate art directly to the domain of ideas, or concepts; and minimalism, which stripped art of of any sense of personal expression. His sculptures are the subject of a show in New York's City Hall Park, "Sol LeWitt: Structures, 1965-2006," which will be in place until December 2 of this year. The work that is positioned nearest the main, southern entrance to the park, Splotch 15 (2005) (photo above), is one of his later works, made after he broke from strict minimalism and allowed his art to be more expressive. Three X Four X Three (1984) is typical of LeWitt's earlier work: strictly geometrical and monochromatic; form reduced to its essence. Large Modular Cube (1969) is even more minimalist: a simple cube in outline. Complex Form 6 (1987): the title says it all. By the late 1980s, LeWitt began creating more visually stimulating works, breaking from the simple geometry of cubes and designing multifaceted, asymmetrical forms. For skies of couple-colour as a brindled cow... .
Another of LeWitt's "architectural" works (early in his career, he worked as a graphic designer in the office of I.M. Pei), and the largest in this show, is Tower (Columbus) (1990), which stands outside the park, on the plaza facing the entrance to the Brooklyn Bridge. The structure suggests the "wedding cake" or "ziggurat" style of architecture that characterized New York City skyscrapers before the zoning law was changed to encourage tall, slender buildings set back on plazas instead of bulky buildings with progressive setbacks. The Brooklyn Bridge cactus survives, and thrives. There's a cactus at the apex of the small triangular garden on the Manhattan side of the Brooklyn Bridge, where the bike and pedestrian paths converge. I must have walked past it a hundred times before a friend, who has a degree in botany, pointed it out to me a couple of years ago. Whenever I walk past it I steeple my palms, bow my head slightly, and say "Namaste". The photo above shows the cactus on August 24, 2010. Here it is last December 17, after some freezing weather. On New Year's Day it was buried in snow. On January 29, the snow was even deeper. By March 19, the snow had melted, but the cactus showed little life. By April 25, the cactus was showing signs of recovery. On May 30 it was looking downright perky. Yesterday, June 4, the cactus had blossomed.